There is an annoying issue with many Schneider Electric APC network managed devices. Sometimes, you want to log in and are greeted with “Maximum Connections Reached” or “The maximum number of web connections has been reached” instead of a normal login process. We saw a number of methods online that did not work so we have a 1-minute process to get this problem fixed. The fix was simple, but we made a short video that you can follow along with. You can even see a few of the potential fixes that did not work, such as using logout.htm, in the video. Applying this methodology will also help you fix the problem for a longer term than opening up space for a single session. Go log on as you normally would to the web interface. That will get you to back to work quickly. This happens to many of our devices so it seems not limited to one PDU model. This is an annoying issue especially as it persists even though web sessions are closed from the client side. 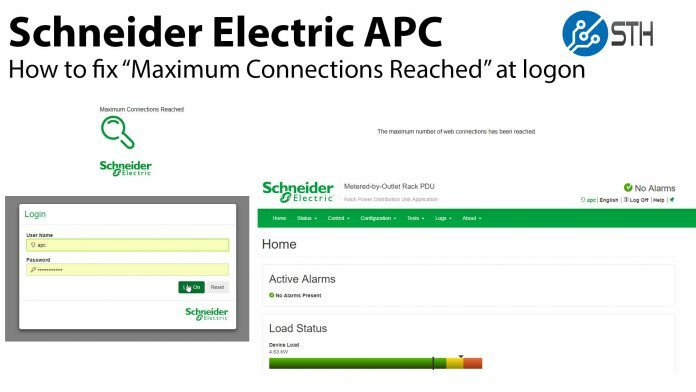 If you have APC, now Schneider Electric devices that are web and network managed, bookmark this fix. We see this with our various units about once a quarter. Since some of the older fix methodologies such as using logout.htm or simply opening then closing a session do not work for us, we think this is a better way. It also removes all sessions rather than simply a single session so we do not run into the issue for some time. This information is quite helpful for the community – much appreciated. However, I would not call it a fix, only a workaround. Do we have comment from the vendor on a potential firmware upgrade to properly address this issue?